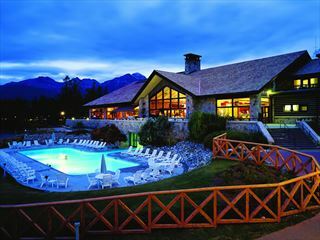 Mount Robson Inn allows guests to be perfectly situated for city exploring, including shopping and popular attractions like the Jasper Artists Guild that can be enjoyed just five blocks away, as well as for popular outdoor activities like skiing and snowshoeing in the winter, and hiking, biking and whitewater rafting in the warmer months of the year. The property conveniently sits along the Marmot Basin ski shuttle route for easy access to the slopes, and guests can look forward to soaking those sore muscles in one of two outdoor hot tubs after a day of play all year round. To get fueled up for an active day, take advantage of the hot and cold breakfast buffet, included in room rates, and on a chilly day, enjoy cozying up to the warmth of the crackling fire in the lobby fireplace. Ideal for families with little ones, parents and grandparents appreciate complimentary items like a crib, high chair, bottle warmer, night light and outlet plug covers. One Queen Guest Rooms – The Queen Guest Room is a European studio-style room that includes one queen-size bed and all standard amenities, along with a club chair and desk. 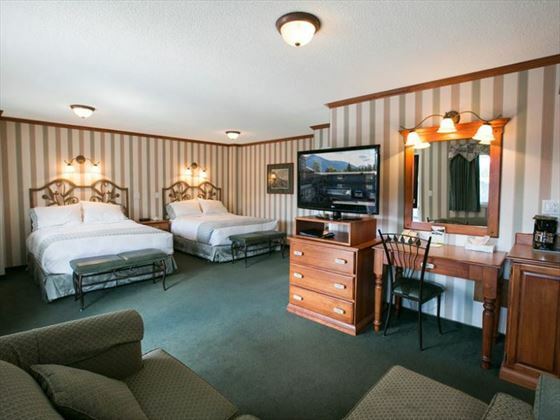 Two Queen Standard Rooms – These rooms include all standard amenities and two queen-size beds. King Standard Rooms – The King Standard Rooms include one king-size bed and a vanity area outside of the bathroom for added space, along with all standard amenities. 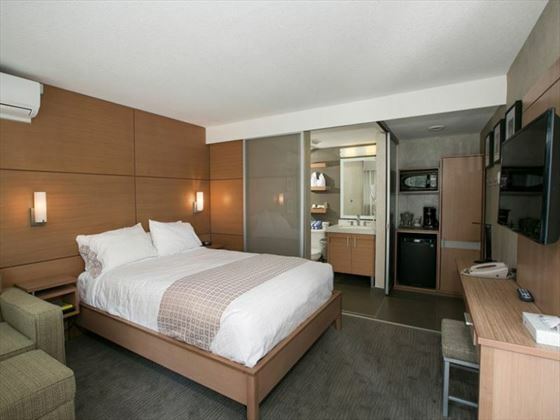 Deluxe Two Queen Rooms – These recently renovated rooms offer added space and include two queen-size beds, a spacious seating area and a full-size desk, and an additional vanity outside of the bathroom. Three Bed Family Rooms – A room designed for families or groups, the Three Bed Family Rooms include a main room with two double-size beds and a private bedroom with one double-size bed, as well as an additional vanity outside of the bathroom. Double + 2 Singles Family Rooms – Another good choice for small families or friends traveling together, this room includes one double-size bed and two single beds as well as a table for two and an additional vanity outside of the bathroom. 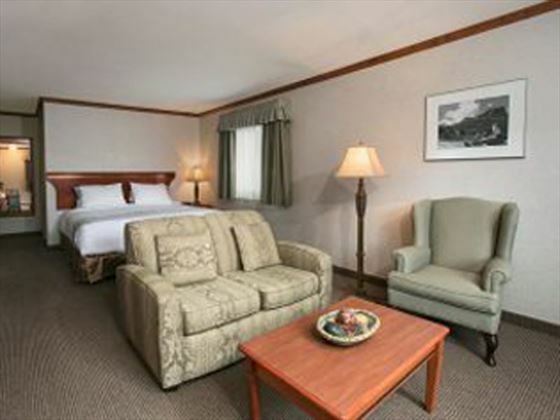 Miette Executive Suite – This suite boasts a south facing few of the mountains in Jasper National Park as well as a spacious seating area with a fireplace. It also includes a king-size bed and a table for two, in addition to all standard amenities. 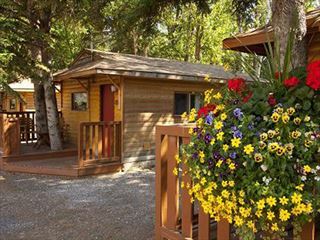 Sunwapta Jacuzzi Suite – Ideal for honeymoons and all types of couples seeking romance, this suite includes a king-size bed and an in-suite Jacuzzi that sits adjacent to a sitting area. The bathroom offers the added feature of a body massage shower and heated floors. Robson Family Suite with Bunks – This suite includes a main room with a king-size bed, a full bathroom and a sitting area with a sofa bed as well as a separate kids’ bedroom that features a bunk bed, PlayStation 3 console and a second bathroom with a shower. Multi-Level Tekarra Suite – This suite provides south facing mountain views as well as extra space for families, or up to four adults. The main floor includes a queen-size bed and living area with a fireplace along with a sofa bed and a bathroom. The second floor features another queen-size bed and a second bathroom. There is also a writing desk and a table for two. Whistler Suite – The largest of the suites, the Whistler Suite offers spectacular Rocky Mountain views as well as a spacious living room with a fireplace and a king-size bed. The living room includes a sofa bed, oversized TV and bar counter, in addition to all standard amenities. Patricia Jacuzzi Suite – The most luxurious of the property’s suites, the Patricia Jacuzzi Suite is ideal for those seeking a romantic escape with an in-room couples’ Jacuzzi, an electric fireplace and an intimate seating area. It also includes a king-size bed, full-size desk and stunning mountain views. The Mount Robson Inn serves a complimentary hot and cold breakfast buffet between 7 a.m. and 10 a.m. daily. 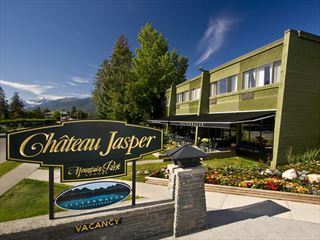 This property is located near the slopes of Mount Jasper, just five blocks from downtown Jasper and within a mile of the Jasper Information Centre National Historic Site and the Jasper Artists Guild.